Its funny, its got quality slap stick and its definitly Get Smart. You want more detail? OK. Far too many TV remakes have become cynical, star vehicle exercises. Shows which wern’t comedies reduced to a series of punch lines, some "funny" period references (drugs, flared trousers, sexism, bad haircuts or whatever) and a manufactured gag reel for the end credit because Jackie Chan had great end title gag / accident reels. 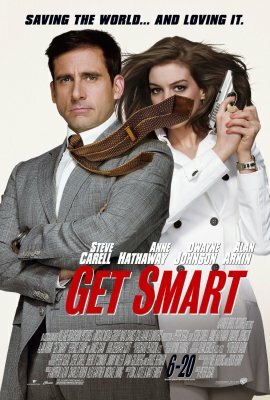 Get Smart isn’t one of those remakes. Yes its a star vehicle for Steve Carell, Anne Hathaway, Dwayne Johnson and the rest of the cast but their all playing their part not just playing for cheap laughs. Thats not to say there is a shortage of laughs. There are plenty of them. Not say Airplanes constant in your face assault but a high enough count for a comedy film. Theres enough slapstick without it becoming heavy handed. Then again it ought to be hard to mess up a comedy origally created by Mel Brooks and Buck Henry – just distil out the best gags from the original and use them in a well constructed story. My final verdict – funniest film I’ve seen in 2008 so far.